Winnie Soon is an artist-researcher whose works intersect media/computational art, software studies, cultural studies and coding practice. 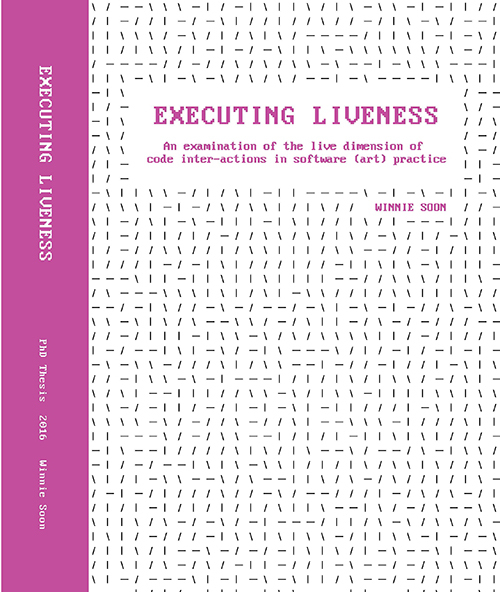 She has awarded the Top-Ranked LABS Abstracts 2017 by Leonardo and the Winner of The 2018 Aarhus University Research Foundation PhD award with the thesis titled “Executing Liveness: An examination of code inter-actions in software (art) practice”. Artistically, she has received the Expanded Media Award for Network Culture at Stuttgarter Filmwinter — Festival for Expanded Media and Public Library Prize for Electronic Literature (short-listed), Literature in Digital Transformation in 2019. Winnie’s working experiences in the telecommunication and media industry of Hong Kong and her profession as a researcher and educator in Denmark, China, Hong Kong and United Kingdom allow her to conduct inter-disciplinary, cross-cultural conversations with professionals, practitioners, artists and researchers. She is a member of the Critical Software Thing Collective, a co-founder of NN Cluster at Aarhus University, a senior research affiliate of the Humanities and Critical Code Studies Lab, an Information Architect and advisor of A Peer-Reviewed Journal About. Currently, she is Assistant Professor at the Department of Digital Design and Information Studies, teaching Aesthetic Programming and Digital Culture. Winnie’s artworks and research examine the cultural implications of technologies in which computational processes and infrastructure underwrite our experiences, which are ever more programmed. Her works explore themes/concepts around computational culture, specifically concerning automated censorship, data circulation, real-time processing/liveness, infrastructure and the culture of coding practice. Her projects and lectures have been presented internationally at museums, art festivals, libraries, universities and conferences, including but not limited to ZKM (DE), The Photographers’ Gallery (UK), Transmediale2015/2017/2019 (DE), Electronic Literature Festival2018, ISEA2015/2016 (CA, HK), Stuttgarter Filmwinter — Festival for Expanded Media, WRO Media Art Biennale (PL), ARoS Aarhus Art Museum (DK), Moesgaard Museum, Image Galleri (DK), Si Shang Art Museum (CN), Pulse Art + Technology Festival (US), FutureEverything Art Exhibition (UK), The Wrong – New Digital Art Biennale, Hong Kong Microwave International Media Arts Festival, Taipei National University of Arts, Karlsruhe University of Arts and Design and The University of Hong Kong. Winnie’s current research focuses on computational art practice and aesthetic coding in the realm of software studies, working on two books titled “Aesthetic Programming: A Handbook of Software Studies” (with Geoff Cox) and “Fix My Code” (with Cornelia Sollfrank). Recent contributions to publications include “Execution” in Posthuman Glossary (with Critical Software Thing), ‘Executing Microtemporality’ in Executing Practices and “API practices and paradigms” in First Monday (with Eric Snodgrass). Research interest: Research through creative and critical practice, (Critical) Machine Learning in Art and Culture, Software Studies and Criticism, Computational/Internet/Software/Media Art, Humanistic/Exploratory/Aesthetic Programming.